Make your own quick salsa, and not just any typical salsa – one with fresh fruit and creamy avocados. These fish tacos wrap all the good things right in your tortillas. 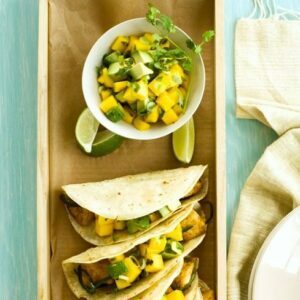 For salsa: place mango, avocado, scallion, cilantro, juice and ½ tsp salt in a bowl; toss gently. Set aside. Combine cornmeal, cumin, chili powder and remaining 1¼ tsp salt in a bowl; add fish and toss until coated well (discard excess coating); set aside. Using 2 tablespoons oil, lightly brush onto one side of each tortilla. Heat a large nonstick skillet over moderately high heat. Add tortillas in pairs with uncoated sides together and cook, turning once, until just golden and starting to crisp, 2 to 4 minutes. Transfer to a plate and cover with a towel. Heat remaining 2 tablespoons oil in same skillet. Add jalapeño and fish; toss to coat with oil. Cook, stirring occasionally, until fish is just cooked through, 4 to 5 minutes. Spoon into paired taco shells. Serve with salsa, lime wedges and hot sauce, if desired. The cornmeal forms a delicious crispy coating. Fish cooks so quickly, you only need to cook it a few minutes in a hot skillet.